Just to finish up we also dropped by two other places for a quick bite in between our travels. Minamoto Kitchoan is a Japanese patisserie or sweets store in the upper east side that sells "doremon" cakes and various Japanese jellies . Some of the jellies are seasonal and of the ones I’ve tried I love the momo (peach) jelly which contains pieces of the white peach inside and the plum jelly which contains a sour plum inside. These are delicious traditional Japanese treats are wrapped exquisitely making them also great gifts. Japanese cake filled with sweet red bean paste. 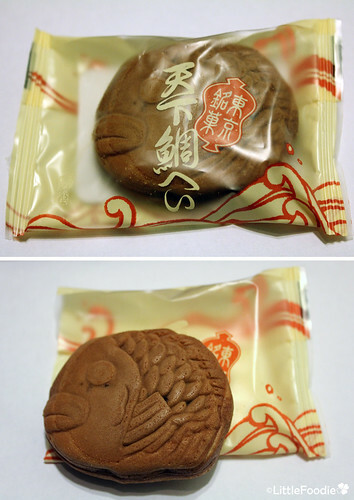 The cake is made in the shape of a snapper or “Tai” and is a symbol of happiness. Usually this is given for weddings and other celebrations. Unfortunately these treats are a little bit expensive. Also major downside is that there is a bit too much of the pretty packaging - environmentally friendly is not on the agenda. 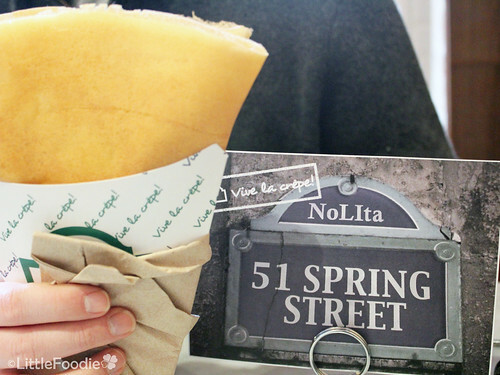 Great little place in Nolita called Vive La Crêpe provided the perfect comfort food the day after a big night out in NYC. We shared a savoury crêpe made fresh and filled with melted raclette chese on prosciutto and sweet mushy (but not mashed) potatoes. This ends our little trip to NYC...but I'm sure we will be back to enjoy more of what the city has to offer. Service: Slow but very courteous. Damage: $3-5 for each treat. Damage: $6-7.50 for sweet crêpes and $7.50-9.50 for savoury crêpes.